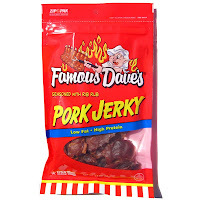 Next in the series on Famous Dave's, is this Pork Jerky. See my previous reviews of their Original and Apricot Bourbon beef jerky. Famous Dave's is a brand of Famous Products, Inc., based out of Eden Prairie, MN. Famous Dave's is known mostly for its line of award winning BBQ sauces and its chain of 170+ restaurants. 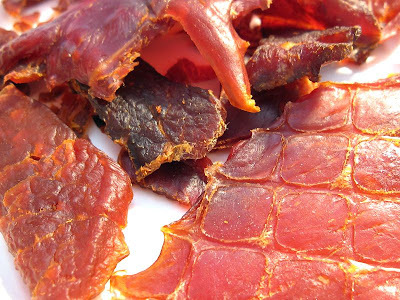 This Pork Jerky is actually the last of their line of jerky, in addition to their Original and Apricot Bourbon beef jerkies. It's said to be made using the same rib rub that transformed Dave Anderson into "Famous Dave's". All of Famous Dave's jerky is manufactured by Jerky Snack Brands, of Mankato, MN. 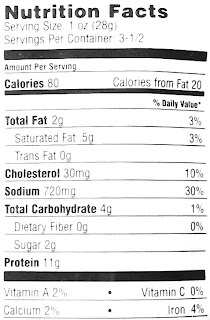 Pork, water, seasoning (brown sugar, salt, maltodextrin, sugar, monosodium glutamate, hydrolyzed protein, onion powder, molasses, garlic powder, wheat starch, soybean oil, extractives of paprika, caramel color, natural flavors, soy flour, with less than 2% silicon dioxide), sodium nitrite. The first thing I taste from the surface of these pieces is a salty flavor, followed by a seasoning blend with a noticeable garlic and onion. The chewing flavor is largely more of the surface flavor, with a little bit higher saltiness, and just a faint bit of meat flavor. Considering the highlight of this jerky is Famous Dave's Rib Rub, this pork jerky definitely does carry the flavor of a seasoning blend. I haven't personally had Famous Dave's Rib Rub, so I don't know how close this tastes like that, but it certainly does taste as if it would. It's pretty much like shaking a container of seasoning blend on my tongue. The seasoning has a lot of saltiness in it, which I'd consider at a high intensity. I can also identify a well-noticed garlic & onion flavor. As for the pork itself, there's just faint traces of meat flavor. I notice it by first sucking on a piece for several seconds to create a comparison between that and the chewing flavors. The chewing reveals a slight meat flavor. But if you're just snacking away and not analyzing like I am, you may not notice any kind of meat flavor. Overall what you'll taste in this jerky is the seasoning blend, having a good deal of saltiness, with some garlic & onion flavor. These are slices of whole meat, sliced to a medium thickness, and in small to medium sized pieces. There's also several bits of jerky in the bottom of the bag. This is a dry jerky, but still having a soft, pliable feel. Tearing pieces apart with my fingers seems easy to do, while chewing also seems easy. The chewing texture starts out feeling stiff, but easily chewing down to a soft mass with little effort, and with little rubbery resistance. Once down to a soft mass, it has a very meaty feel, fibrous, with a little bit of crumbly texture. Some of it kinda does resemble a chunk of rib meat, but a dry chunk. In terms of fat, I see some pieces with a lot of fat, and others with none at all, a mixed bag. But I didn't encounter any chewy wads of tendon or gristle, and no stringy sinews. It's also somewhat clean eating, with just a faint bit of oily residue on my fingertips, but no tiny fragments of meat found on my lap or desk. Famous Dave's sells this Original variety from its website at a price of $5.49 for a 3.5oz package. I bought 3 packages, each a different flavor. Add to that shipping costs of $8.29, and it brings a total of $24.76. That works out to a per ounce price of $2.36. 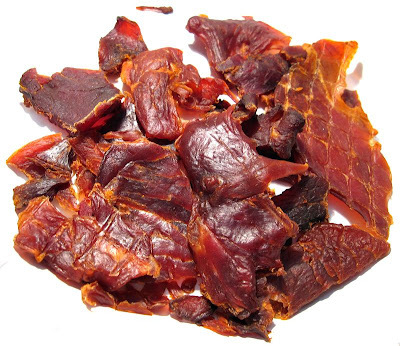 For general jerky snacking purposes, at the $2.36 price per ounce, it's a weak value. I'm getting just a minimal amount of snackability for a simple tasting jerky, though it's easy eating and has a decent chewing texture. That $2.36 price per ounce is considerably higher than what I'd pay for mass-market jerky at the grocery store, but yet offers comparable, or lower snackability. As a Pork Jerky with Famous Dave's Rib Rub, at the $2.36 price per ounce, it seems to be a decent value. It definitely carries a well-noticed seasoning blend flavor, and a chewing texture that you could resemble that of a dried chunk of rib meat. This Pork Jerky from Famous Dave's is said to be made with his famous rib rub seasoning, and it definitely does have a well-noticed seasoning blend flavor. But I kept getting the sense that this jerky is quite one-dimensional, with that seasoning blend being the only flavor. It's quite a salty flavor, but with some noticeable garlic & onion flavor too. There's just a smidgeon of meat flavor in there, and maybe too small for general jerky snackers to notice. The meat consistency seems good in that it's easy to tear apart and chew, and it does seem to have meaty chew, which you might even believe resembles that of a dry chunk of rib meat. But other than that, there's little else in this to differentiate pork jerky from beef jerky. The first few pieces are actually enjoyable, but due to that low flavor complexity, and higher saltiness, this jerky had difficulty keeping my interest, and hence it lost snackability. I think a good beer pairing for this is a red ale.